Earlier today, I had the huge pleasure of attending the Trial of the Pyx in the sumptuous surroundings of the Goldsmith Hall just by St Paul’s Cathedral. The trial occurs on the second Tuesday in February every single year – and is truly ancient in nature, having happened every year since the year 1282. The trial is basically a test to ensure that the coinage of the realm is of good quality, and unlike many quaint ceremonies in the City of London, this one is still a legally binding procedure. The name of the test – the Trial of the Pyx refers to the wooden box which is used to transport the coins to be tested from the Royal Mint to the Goldsmiths Hall. The benchmark against which the coins are measured is known as the Trial Plate, and these were kept under the personal guard of the Monarch, in the Exchequer. The earliest surviving Trial Plate is stored in the Royal Mint, and dates from 1279. Trial Plates are still used today – although they are managed by the National Weights and Measures Laboratory – who send a representative to the Trial to deliver them to the Court. The earliest trials were held in Westminster Hall – and later at the Exchequer. 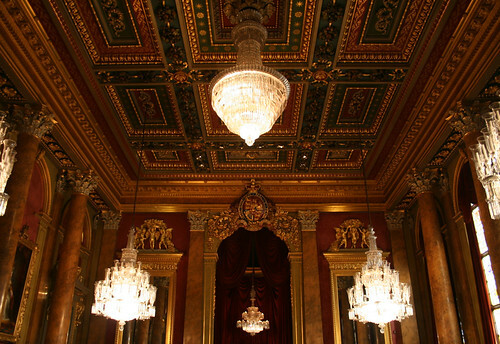 It was Queen Elizabeth I who finally granted the responsibility for the Trial to the Goldsmiths’ Company some 500 years ago – and in 1870, the trial moved to Goldsmiths Hall, where it had remained ever since. This actually makes sense, as the Assay Office is also based in the Hall, and it is they who carry out the second phase of the trial. The first phase of the Trial is presided over by the senior judge in the Court of Justice, known as the Queen’s Remembrancer, supported by his two clerks. The Jury comprises the Prime Warden of the Goldmiths’ Company with the three supporting Wardens, the Head of the Assay Office, and a selection of the Company’s Liverymen who make up the Jury. The size of the Jury will vary each year depending on how many coins are to be counted (I presume it was very large when the UK minted its initial batches of decimal coins). It was to observe the first part of the trial that I was at Goldsmiths Hall this morning, for they allow a small number of people to attend and watch the proceedings. I was accompanied by my friend, Matt from The Londonist. We arrived and were guided to seats for the visitors in the main hall – where a long table had been set up for the testing to take place. Once everyone was settled, an explanation of the morning’s events was laid out along with some of the history above. The first phase of the Trial is the counting and weighing of coins brought to the hall in the Pyx boxes. Throughout the year, one coin from every single batch minted by the Royal Mint is set aside and put in sealed bags, each containing 50 coins. These bags are placed in the Pyx boxes for the Trial. It was explained that some 63,000 coins were to be counted this morning – although the jury would only have to count about 6,000 of them, being denominations of £1 and above. Smaller coins are counted by machines in a side room. The coins face value was said to be around £35,000 – although as a fair number of them would be specially minted sovereigns and the like, the actual value is far higher. Once the introduction was over, the Jury was shown in, along with other officers for the event – and then the Judge arrived. As the room was now formally a Court of Law, we all stood as he walked in, and photography was strictly forbidden. Interestingly, the Judge, as the last surviving member of the old Court of Exchequer is required to wear on top of his full bottomed wig, a black tricorn hat of the former Cursitor Baron (judge) of the Court of Exchequer. So, as he walked in, it was a bit odd to see a Judge in full wig and gown – and also wearing a hat. As another nod to how ancient this ceremony is, the Office of the Queen’s Remembrancer is now the oldest judicial post to remain in continual existence since the Middle Ages – since the Lord Chancellor whose post predates that of the Remembrancer by some 60 years – has decided to renounce his judicial duties. The legal warrant was read out by a clerk and then the Judge issued the oath to the jury – once for the British trial, and a second one for New Zealand who are also participants this year (the High Commissioner was in attendance). The Judge read out a short speech, with some amusing anecdotes as a welcome to the event and adjourned the court until May 1st. The Judge then stood (as did we) and left the room (we stayed) – and at that point the room is no longer a court, so out came cameras to record the rest of the event – including some official photographers. Now the event started in earnest. Two bowls were already placed before each member of the Jury – one of wood and one of copper. 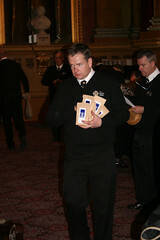 Staff from the Royal Mint opened the Pyx boxes and carried paper bags containing the coins to the Jury members. 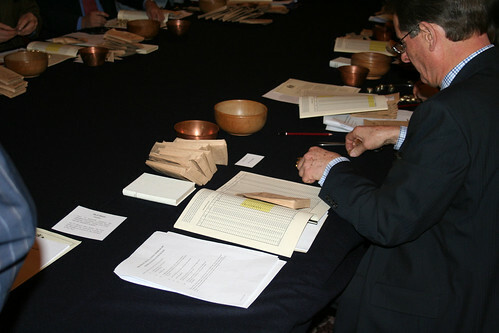 The Jury member opens the packet and selects a coin at random and puts it in the copper bowl – placing the remaining 49 coins in the wooden bowl. This wooden bowl is later weighed to check that the coins are the correct weight. The copper bowl will be taken away once the event is over, and the coins in that will be handed over to the Assay Office who will, over the next couple of months carry out detailed tests to confirm that the metallic content is as it should be. The trial also includes the special Maundy Money which is handed out by The Queen on Maundy Thursday – as those coins are in fact legal tender, although in real terms worth vastly more than their face value. The Court meets again in May for the second phase of the Trial, which is the delivery of the Assay Office’s verdict to the Judge to confirm that the coins are good and true to the law of the land. In the earliest days, when coins were made of actual silver alloys, it was vital that the coins contained the correct composition of metal to ensure that they held their true worth. Today, while coins in general circulation are no longer made from precious metals, and we rely on the trust that they can hold a monetary value, the trial might seem to be less important. In fact, as trust in the banking system underpins the value of the currency, if anything, the trial is actually more important as it is a formal certification that the coins of the realm are indeed true and trustworthy. Forging currency is still considered to be a very serious crime, as it undermines trust in the currency – and dealt with more severely than the value of the fraud might seem to warrant. Although, as I noted, the coins no longer contain precious metals in them – they are not without intrinsic value. Indeed, last year at the height of the boom in the price of metals, the USA had to pass a quick law to make it illegal to melt coins down for their copper content. It turned out that a one cent coin now contained more than one cent’s worth of copper in it – and melting down the coins for scrap could turn a quick profit! So, this morning the Trial occurred for the 727th time (even a bomb being dropped just before the Trial in 1940 didn’t stop it) and in a couple of months we will know if the coins in your pockets are still being made to the exacting standards set down by law. There hasn’t been a failure in the verdict for a very long time, and if the coins were found to be flawed, then the Judge would have to pass sentence on the issue. While in the early days, the coins were indeed unreliable, the Royal Mint now rarely makes mistakes, and there hasn’t been a problem with the Trial verdict for many decades. Many thanks to the Goldsmiths’ Company and the Royal Mint for letting us watch this ancient tradition – and if you can get a few hours off work, the Hall is open for a few public tours during the year and is really worth a visit. They also have a few exhibitions during the year – last year’s Treasures of the English Church was stunning, although the exhibitions do not include tours of the rest of the building. Their next exhibition, entitled Silver with a Pinch of Salt, looks at the role of silver and the silversmith in the context of the history of salt as a condiment and its place on the dining table. It starts at the end of March but is only open for three weeks (inc Saturdays), so make a note in your diary for that. A few photos of the event are at my usual Flickr account – as the hall was a bit dark and I was shooting from a distance, some of the photos have been adjusted to make the subject matter visible. I really do need to improve my indoor photography skills! an impressive venue. always have wanted to ask if the wigs itch. What a fantastically interesting article. I can’t wait to share it with my Anglophile readers. Cheers! Sounds fascinating. How did,you get tickets? 3 Pings/Trackbacks for "The Trial of the Pyx"